Hanna's room is definitely the most feminine and fashion-forward of the four... which isn't a surprise considering Hanna Marin is the popular, fashionable, girly girl of the clique. 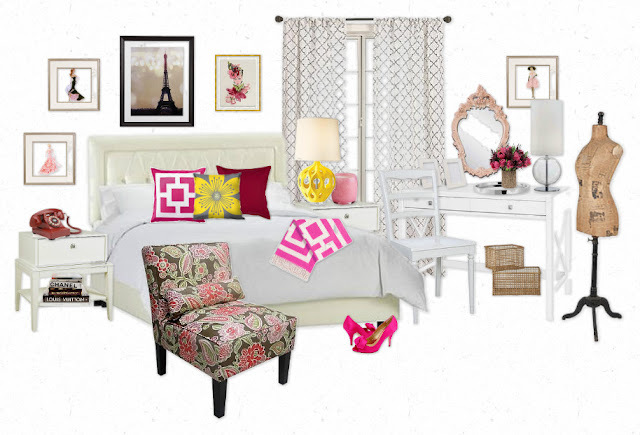 Her bedroom fuses sleek modernity with fashionable luxe with perky charm... making for a Cheerful Glam look. Hanna's color scheme brings together lots of white, beige, and gray... with a bit of pink and red, and then splashes of sunny yellow. Her bed includes an upholstered headboard and lots of patterned throw pillows. Her nightstands are shiny, white, and sharp-edged modern, accessorized with feminine lamps and girl favorites like pictures, magazines, and a colorful phone. 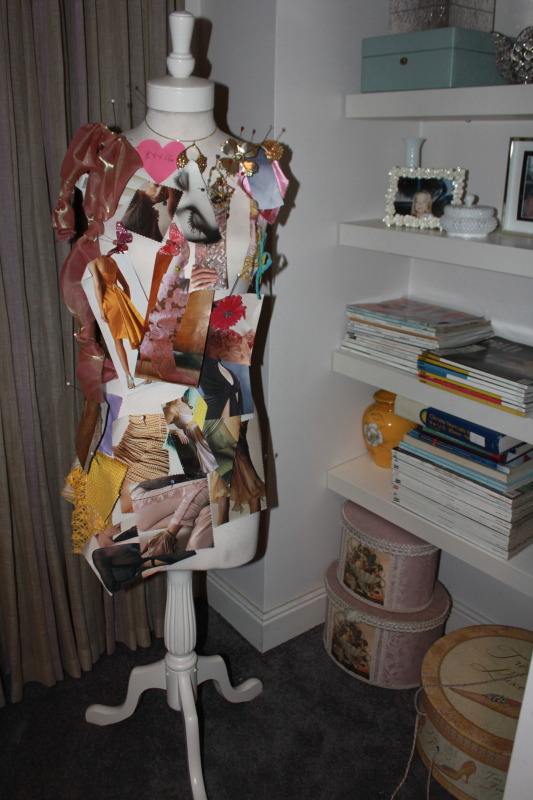 Here's my favorite item in Hanna's space: a dress form used as an inspiration board for fashion magazine scraps and clippings. Hanna's desk doubles as a vanity. Filled with perfumes, nail polishes, and cosmetics---all kept tidy on pretty trays---Hanna probably does more primping here than homework. Another (smaller) mannequin inhabits the array of accessories. A glass lamp gives light. Flowers freshen up the desktop. And a funky, ornate mirror tells Hanna who the fairest of them all is. Nearby woven wicker boxes add storage. And I love her white chair with its yellow cushion. Hanna's room also features a second bed---a daybed that she often lounges on. A huge canvas painted yellow hangs on the wall above as bright, cheerful artwork. I love the pairing of pink and yellow all over Hanna's room. Speaking of bright yellow... check out that lamp! Its base adds a bold pop of color and visual interest to that corner of the room, hanging out among metallic picture frames. A black and white photograph of the Eiffel Tower hangs on Hanna's wall. 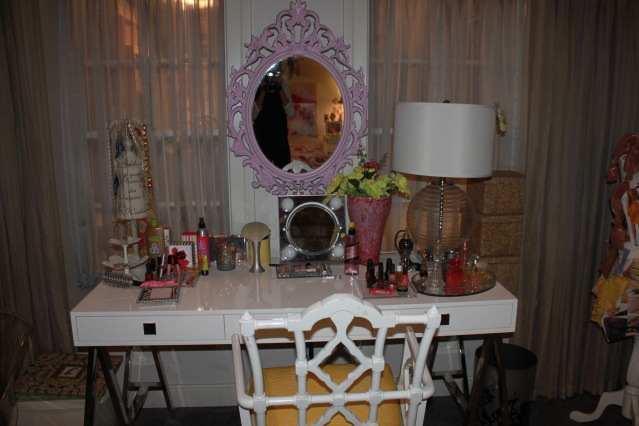 Here's a close-up shot of Hanna's desktop/vanity. 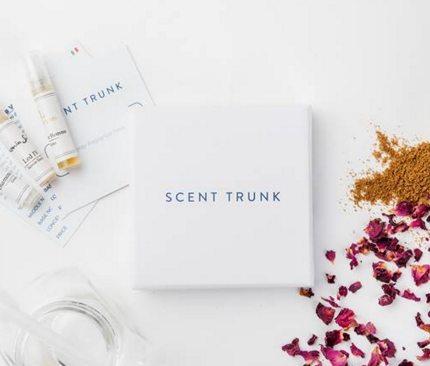 She organizes perfumes on an antique mirror-top tray and keeps track of smaller cosmetics on a square lucite tray. Just goes to show how organization can be glitzy and glamorous! The other side of Hanna's desk features another square lucite tray, plus a lily-inspired jewelry stand. Furniture: Hanna's room is a bit less eclectic than the other girls' rooms... all of her furniture is clean, white, and mostly modern. For the bed you'll want to go with a headboard upholstered in a white, cream, or beige fabric. (If you can't find one, there are tons of tutorials for this on the web.) Keep the bedding itself light and neutral. Opt for nightstands that are sleek and white---same goes with the desk. Rather than adding a daybed to my moodboard, I went with an armless chair for extra seating. Pattern & Pillows: On the bed, add a pink blanket. Hanna's was a tie-dye floral design, but I love this hot geometric throw. In your array of pillows, include a pink one, deep red one, and gray and yellow one. Go with white curtains that have a bit of a pattern to them, like these trellis-printed panels. If you can't have floral wallpaper, add floral patterns in other ways---for example, a rug or floral-printed furniture like the armchair I used. Accessories: Vintage dress forms aren't hard to hunt down if you really look. 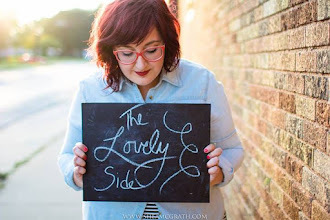 Antique stores, thrift and vintage shops, and Craiglist are great places to start. Check those same places for a great, ornate mirror that you can paint pink, silver or lucite trays for your perfumes and cosmetics, plus bright colored vintage telephones to display. Look for lamp bases that are clear glass or bright yellow. Keep the shades simple and white. Bring in some natural texture with some wicker storage bins or baskets. Hang a statement-making Eiffel Tower print on your wall, as well as fashion-inspired art sketches. A vase of flowers, pretty pink candles, and your favorite pair of pump amp up the feminine factor. This is great, I love watching pll and I'm looking forward to doing these myself. 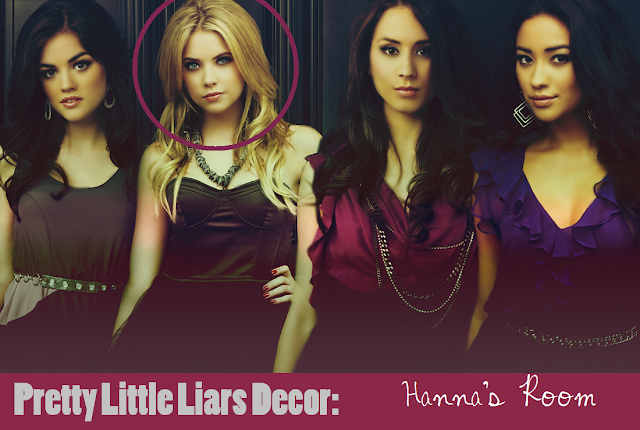 Do you happen to know where I could find Hanna's headboard tutorial? I have searched everywhere but can't find anything. I love watching PLL, it looks great! where can you get a wall paper or stickers on the wall like hannah's??? 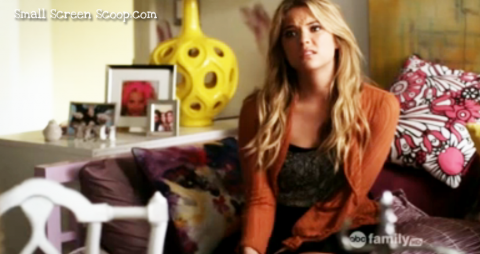 Hanna's room is my favorite! So lovely and feminine, her wallpaper is awesome, love the pattern and color. I think what got me hooked to the show at the beginning was the decor and fashion. I love the girls rooms and their clothes are always so pretty (sometimes it's hard to believe anyone would go to school dressed as they are though. Anyone know where I can find that Eiffel tower picture? I love PLL the show is great! I love the bedroom but I need help what color of walls should I use if I use the colors pink and red and gray and yellow. Please help me!!!! I would go for a nice light gray color. Choose the second or third lightest gray. It will give it a little hue of gray but not have it overpower like a full scale gray. Although a little darker would look great against pink, red and yellow color. Add white to the room with accessories. Buy a white mirror or paint one. I would also add glass to the room. Buy a cute glass lamp or add glass shelves for the tables. Get yourself a throw rug with a geometric feel to it, in black and white. Also different textures in the room will soften up the whole room. Good luck. How do you make these pictures they are awesome! 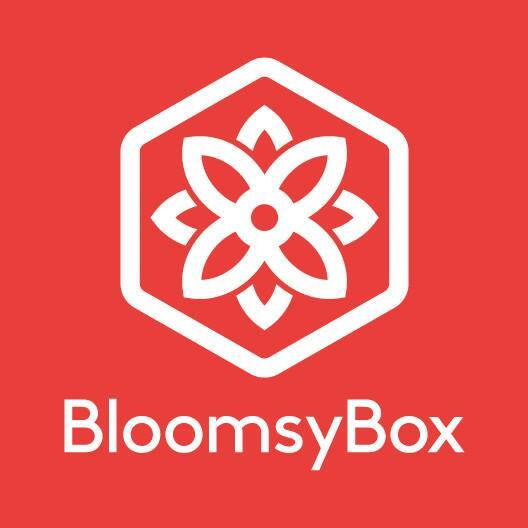 Do you use or polyvore? How exactly do you find the wallpaper on troveline.com? Can you tell me the link or something? B/c I can't find it at all when I looked! :/ Please & thank you. hey so like i was looking for a mirror like hers and i found one EXACTLY like it on ikea for only $40! So i just wanted to share this for people that want that mirror :) k bye. where can i find that tie dye throw? or is it dyi? Do you know where I can find her desktop/vanity? Thank you! Hannas mirror is from IKEA. I have that jewelry tray setting on her desk/vanity I got it from urbanoutfitter same exact thing! I'm desperate to find hannah's desk, or the one posted in the collage above. please somebody help! Where can I find that desk/vanity? where can i fin a similar desk?? Does anyone know where the yellow lamp is from? I have to have it. I'm thinking I may have seen it on DWR's website. Isn't that lamp also in Rachel Zoe's house? Also, I think Zgallerie or West Elm will have a very similar desk, also try CB2. I'm more interested in the closet. Is it an ikea wardrobe? I love the way it looks, and all the drawers would be perfect for storage for my sister's room. does anyone know where i can get hannas desk? Where can I find that exact picture of the Eiffel Tower ?